You do not have to be a surfer, a would be surfer or mama to enjoy this book. But, be warned, if you have a dream on the back burner and think, I can’t or I’m too old or what about the kids, reading this book might mean you just have to go for it! I don’t have kids, I have never lived in Ireland or France, I have never been married, I’m not an artist and I’m still at the stage of surfing that Wilma Johnson was on about page 50 of her brilliant book Surf Mama. Why then do I hear my own voice in Wilma’s story? Our lives couldn’t be more different. The effort, effect, emotions, frustrations, and eventual rewards of learning to surf are just the same though. Perhaps more importantly is the impact surfing had on her life outside of the surf, the places it takes her, the people she meets, the direction she takes, the friends, the laughs, the beers, the stories. I nod and laugh when her words seem so familiar it’s almost like she has taken them from my own mind with some sort of voodoo thought hoover and emptied the bag onto paper! Haha! This is exactly me when I’m on a 0ft wave on my 9ft monster board! There are many books telling people’s surf story out there but, this one is different. It’s really well written for a start. 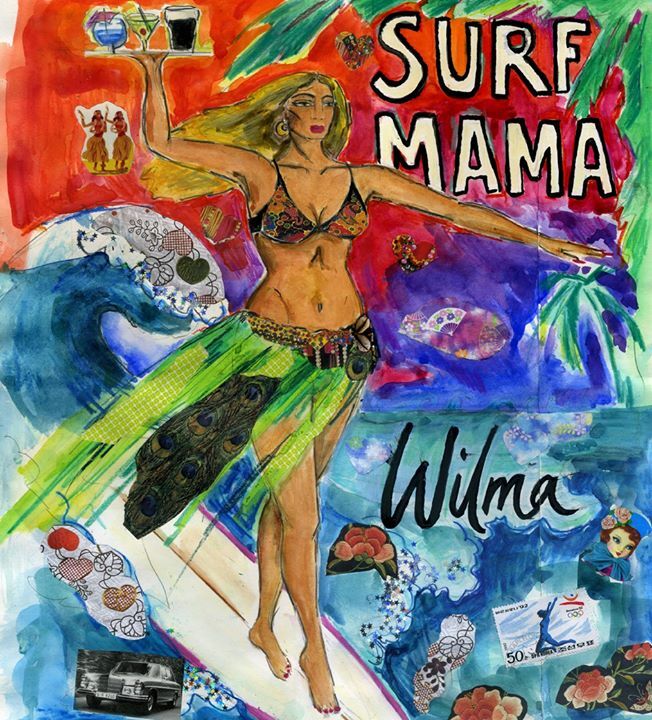 Surf Mama is more than a book about a woman surfing. It’s a wonderfully written account of a witty and adventurous spirit who takes life by the balls and does things her own way. Along the way there’s travel, adventure, frustration, disappointments, a little romance, a lot of fun and a few beers on the beach. Wilma is a successful artist and throughout the book Wilma mentions a work in progress. The fact that this body of work exists and is now complete brings the book to life even more for me, you can see The Seven Surf Mamas here . I looked at them while I was reading the book and it added a huge, bold, splash of colour to the scenes I had imagined. I absolutely adored this book, I read it on a solo surf trip to Morocco and lots of other people there had read it to . I decided I had to tell Wilma how much I loved it so I did on twitter. Much to my surprise and delight she replied and we had a brief exchange regarding donkeys and camels. I thought I’d push my luck and ask her to answer a few questions, here’s what she had to say. 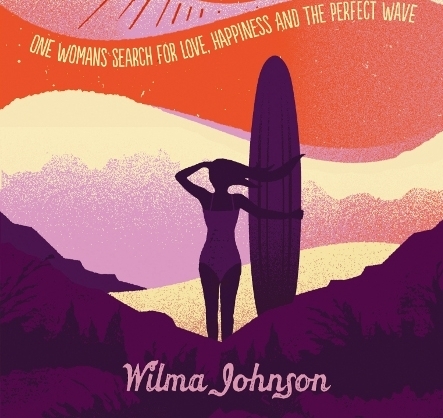 I loved the book, it’s the first surf related book that I have identified with, and all the surf chicks I know who have read it felt the same. Why do you think it strikes such a chord with people? 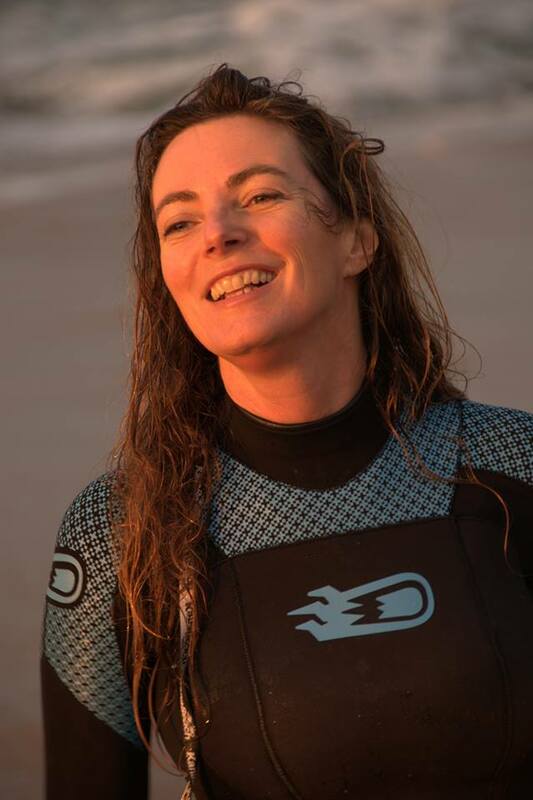 Part of the reason I wrote the book was that I got sick of the stereotype of surf chick as Californian bikini model–it’s about going out there, getting a wave, having a laugh, having a beer, not about being a bloody cheerleader….I think women identify with that, and it’s not just about surf, I’m saying whatever you want to do, go for it! How’s your surfing coming along? Ready for Pipeline yet? I’m really pleased with what I’ve achieved, in the beginning I thought if I could just stay standing for ten seconds, my work would be done! But Pipeline will have to wait because I got a frozen shoulder – very painful and I’m in dry dock right now…. While you were learning, back in the days of being scared of 1 meter waves, what was the best piece of advice to you were given to help you push through and progress? 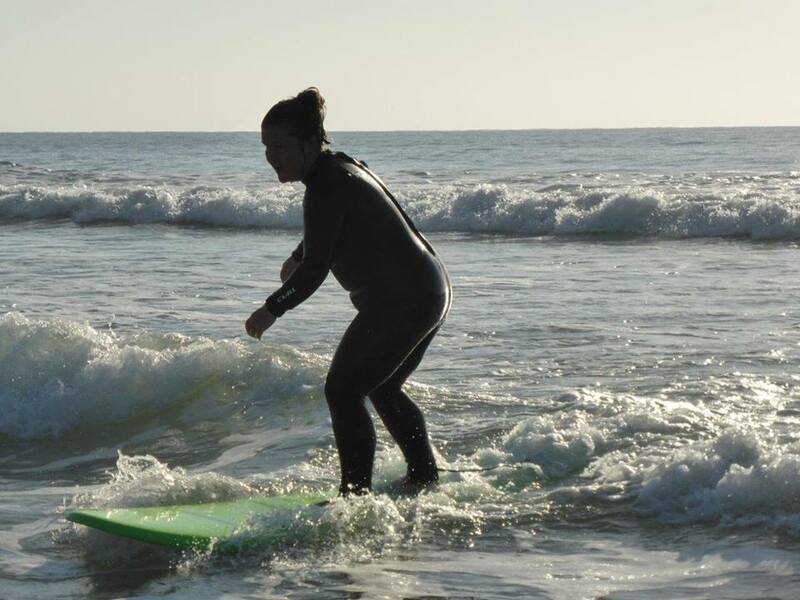 The Seven Surf Mamas series is fab and obviously connected to your surfing. Did your work change as your surfing progressed? My work has always been autobiographical, and when I started the series I couldn’t stand up. I felt like I couldn’t finish the first painting until I could, so I think in a way the painting inspired me to surf better! Well, due to the frozen shoulder, my world tour ending with me winning the Pipeline Masters is on hold, but I am writing a new book … and if you’re ever down this way, do stop by for a beer! There you go, you heard it here first! (possibly if you don’t read Wilma’s blog) Wilma Johnson is working on a new book. For those of us who have read Surf Mama a giant hoo-rah and those that haven’t, get to it! Wilma comes across as the kind of lady I could be friends with. She’d be your get drunk by accident and have an adventure with friend. Me and Landlocked are off to the WSL (ASP) women’s tour stop in France in October so we might just stop by for that beer and take my other BFF Steph along too!